For the village in County Sligo, see Ballygawley, County Sligo. Ballygawley or Ballygawly (from Irish: Baile Uí Dhálaigh, meaning "Ó Dálaigh's townland") is a Village in County Tyrone, Northern Ireland. It is about 13 miles southwest of Dungannon, near the meeting of the A5 Omagh–Monaghan and A4 Dungannon–Enniskillen roads. An American visitor in 1925 commented on the way the village was laid out: "...Ballygawley, which I found to be a village or settlement on two streets (or possibly on one street which turned at right angles to my left as I stood looking at the buildings when I came in sight of the place). It was a wide street, with excellent cement sidewalks not very wide, and the buildings came up flush with the sidewalks, and there were no alleys, driveways or paths between the buildings." It is a compact village around the ‘L’ shaped Main Street and Church Street,formerly Meeting House Street, with a second cluster of development to the southwest. The main cluster inholds most of the village’s facilities; two primary schools, churches and a range of shops and services. The cluster of development to the southwest inholds a secondary school and housing. Ballygawley had a population of 642 at the 2001 Census. Ballygawley is also known as "Errigal-Kerogue" or "Errigal-Kieran", supposedly from the dedication of an ancient church to St. Kieran (Ciarán of Clonmacnoise). It was in the Clogher (barony), along the River Blackwater, Northern Ireland. Some of the remains of the old church were known, and an ancient Franciscan friary, founded by Conn O'Neill, 1st Earl of Tyrone. In the churchyard was a large stone cross, and a holy well. Attack on Ballygawley barracks, 1985. Mickey Harte, the Gaelic football manager who led Tyrone to All Ireland glory in 2003,2005 and 2008, was born in Ballygawley in 1952 (). Ballygawley is acquiring extensive development with the major upgrade to the A4 and the building of the new roundabout to accommodate the traffic congestion from the main Aughnacloy, County Tyrone rd. With these road improvements many contractors have been submitting plans for extensive housing developments. The most exciting of all being the redevelopment of Main st leading onto Church Street, with plans for new bars and restaurants. There is speculation of the Stewart Arms hotel being reopened and other developments such as the health spa at 'Grangemount'. There are other developments such as the rebuilding of Loughrans Castle as a historical building to house historical items from the surrounding area. The Ballygawley River is a major tourist attraction supplying the finest of fresh water fishing in Ireland. The original hydo-electric station at the old Dungannon rd is being rebuilt to provide a large amount of the town's energy. Although having an Irish nationalist majority, Ballygawley is paraded through by the unionist loyal orders without any incident and last held the Orange Orders "Twelfth" celebrations in 2006, and the Royal Black Institutions "Black Saturday" demonstration in 2011. Outdoor activity centre Todds Leap is located in Ballygawley hosting various events and outdoor activities. Ballygawley railway station (on the narrow gauge Clogher Valley Railway) opened on 2 May 1887 but was shut on 1 January 1942. Errigal Ciarán GAC is the local Gaelic Athletic Association club. It is situated in the historic barony of Clogher and the civil parish of Errigal Keerogue and covers an area of 123 acres. The townland contains one Scheduled Historic Monument: a Castle (grid ref: H6324 5749). Ballygawley National School (Tyrone). 1990. Register of Ballygawley National School, 1893-1951. Salt Lake City, Utah: Filmed by the Genealogical Society of Utah. Ballygawley is a town in Errigal Keerogue Parish. The school was under the jurisdiction of the Southern School Board. Microfilm of original records at the Public Record Office, Belfast. Includes indexes. Errigal Keerogue. 1837. A Topographical Dictionary of Ireland. Geological Survey of Ireland, J. Nolan, and E.T. Hardman. 1877. Sheet 34 Ballygawley. Dublin: Geological Survey of Ireland. Scale 1:63 360. Hand colored map. Harris, Mary N.. 2004. MacRory, Joseph. Oxford: Oxford University Press. MacRory, Joseph (bap. 1861, d. 1945), cardinal, was born in Ballygawley, co. Tyrone, where he was baptized on 10 March 1861, one of ten children of Francis MacRory (d. 1867? ), a small farmer, and Rose Montague. Ingram, Brett. 1970. The Armavigil. Ballygawley: the Author. Produced for the Irish Church Independence Centenary pageant. 61 pages. Ingram, Brett. 1960. The Ulstertide. Ireland: s.n. Ulster (Ireland) -- Emigration and immigration. KIRKLAND, RICHARD. 2009. "Ballygawley, Ballylynn, Belfast: Writing about Modernity and Settlement in Northern Ireland". The Irish Review (1986-). (40/41): 18-32. Latimer, W. T. 1900. "Interesting Find at Ballygawley". The Journal of the Royal Society of Antiquaries of Ireland. 10 (4): 368. Ordnance Survey of Ireland. 2011. Mid Tyrone 1900. Dunston [u.a. ]: Godfrey. Map: English: Surveyed in 1833-34, rev. in 1900 and publ. 1902, printed 1904. Scale: 1:63.360. Pringle, Margaret. 1960. History of Pringle family. Salt Lake City, Utah: Filmed by the Genealogical Society of Utah. Margaret Pringle was born in 1836, married a Presbyterian clergyman of Ballygawley, and died 1906. ^ "Ballygawley". Place Names NI. Retrieved 18 March 2013. ^ a b "Ballygawley". Dungannon and South Tyrone Area Plan 2010. Retrieved 11 August 2010. ^ Hadden, John Alexander. 1956. Alexander Hadden: a short biography. Cleveland: Gates Legal Pub. Co. Pages 2-3. OCLC: 3375165. ^ Errigal Keerogue. 1837. A Topographical Dictionary of Ireland. Page 609. ^ "Ballygawley station" (PDF). Railscot - Irish Railways. Archived (PDF) from the original on 26 September 2007. Retrieved 2007-09-10. ^ "Census of Ireland 1851". Enhanced Parliamentary Papers on Ireland. Retrieved 22 March 2013. ^ "Census of Ireland 1891". Enhanced Parliamentary Papers on Ireland. Retrieved 22 March 2013. ^ "Census of Ireland 1851". Enhanced Parliamentary Papers on Ireland. Retrieved 28 December 2012. ^ "Census of Ireland 1891". Enhanced Parliamentary Papers on Ireland. Retrieved 28 December 2012. ^ "Scheduled Historic Monuments (to 15 October 2012)" (PDF). NI Environment Agency. Archived from the original (PDF) on October 26, 2013. Retrieved 28 December 2012. 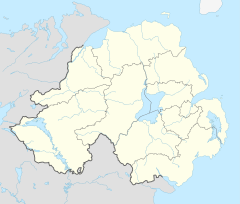 Wikimedia Commons has media related to Ballygawley, County Tyrone. This page was last edited on 23 March 2019, at 12:59 (UTC).